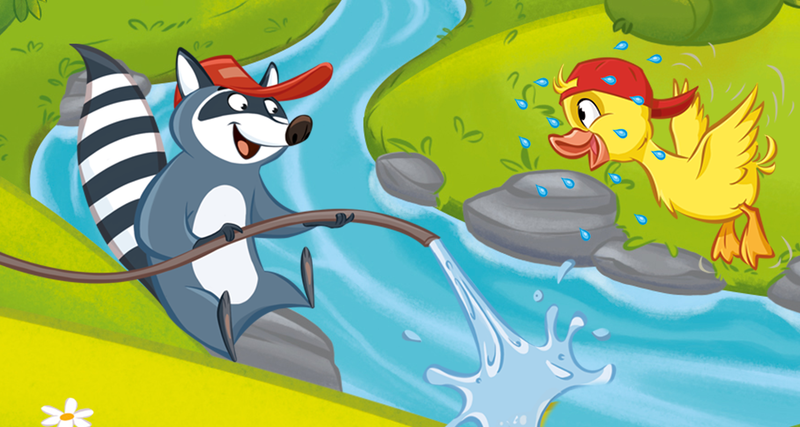 Robin Racoon and Dorothy Duck love splashing in the water. Simply place a large piece of plastic as a slide on the lawn and spray water all over it. The children then slide on their tummies along the wet plastic. Who can slide further than Dorothy Duck? Please make sure that there are no dangerous objects underneath the plastic or at the end! Place easy-to-pick-up objects (for example, a teaspoon or a toy car) in a paddling pool. The little ones now have to fish the items out of the water, using only their feet. Who can fish the most objects out of the water? Everyone knows the egg and spoon race. But have you ever tried it with water? Fill a plastic cup right to the top with water and then run! Who has the most water left in the cup at the end? Professional water runners get a more difficult route! And off you go!